A year bracketed by the restriction of Trinisphere, and the introduction of Portal, 2005 was an exciting time to be playing Vintage. New strategies broke through, new printings surprised, and players like Robert Vroman and Roland Chang became Vintage legends. In the end, 2005 will perhaps best remembered as peak tournament Vintage. There were more large tournaments in 2005 than any year on record before or since, and the tournaments were among the largest in the format’s history, from the record breaking Waterbury, to the nine separate StarCityGames Power Nine tournaments, to gargantuan European tournaments with Grand Prix level prize support. 2005 is a year to remember and reflect upon, and this latest installment of the History of Vintage series provides a trip down memory lane for some, and a discovery opportunity for others. 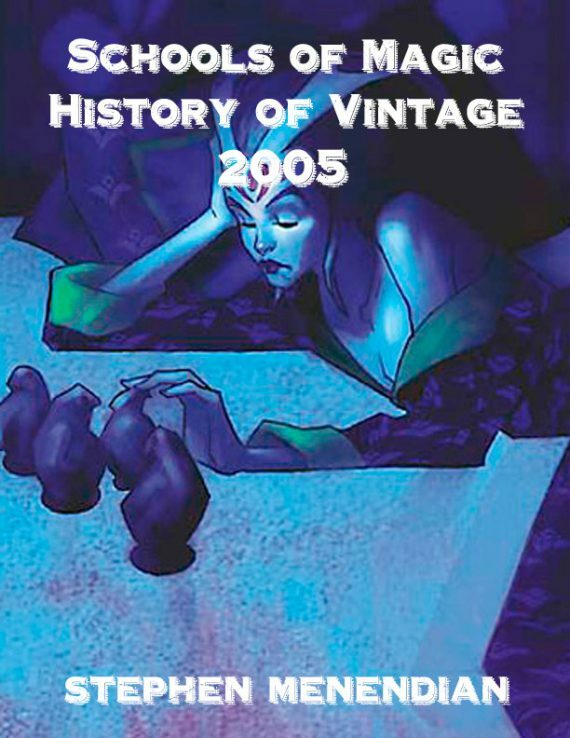 2005 was the high water mark for paper Vintage. It featured the largest and most frequent tournament competition for Vintage players, from the record-breaking Waterbury in January, to the epic French Vintage Championship, to the 170+ player Shooting Stars event in Rochester, to the whopping 366 player Doomsday event in Italy. No tournament organizer had ever attempted anything for Vintage as ambitious as the StarCityGames Power Nine series, a multi-city circuit with significant prizes and professional level coverage. The closest thing was the short-lived Inquest circuit from 1998. At the same time, the metagame was dynamic and fun. The restriction of Trinisphere transformed the metagame, initially flooding the format with Mana Drain decks, but eventually creating space for more creative Workshop based varieties, like Uba Stax and TriniStax to emerge, culminating with the surprising victory by 5C Stax in the Vintage Championship, in the hands of Roland Chang. Upon its release, Gifts Ungiven was a tempting enigma, but few players seemed to effectively abuse it. Despite the many players working on the format, 2005 illustrates a gradual progression in the evolution of the Gifts archetype that ultimately produced a fearsome metagame predator, reminding players that it can take time for new printings to reach their full potential. The legalization of Portal opened doors for combo decks as well. And through it all, Control Slaver was a top tier mainstay, while Null Rod Aggro Control decks found new shells and new tactics thanks to new printings.